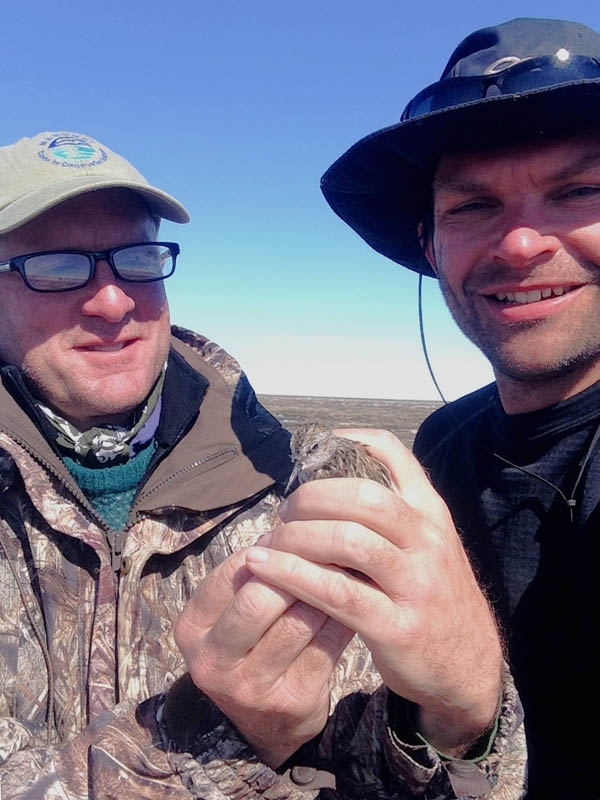 Just a few days ago, Brad Winn and Shiloh Schulte returned from Coats Island with the first two geolocators from the Semipalmated Sandpiper migration study. We were waiting breathlessly to see what mysteries would be revealed! Ron Porter, who is working on analyzing the geolocator data, downloaded and analyzed the data from the first geolocator over the weekend. He produced the map below, which reveals a remarkable odyssey for a tiny bird, the first glimpse ever into the entire migratory pathway of this species. The Semipalmated Sandpiper geolocator project was designed to solve one of the most pressing mysteries in shorebird conservation. Surveys conducted by the New Jersey Audubon Society have shown an 80% decline over the past 20 years in numbers within the core wintering range in northern South America. At the same time, data from the Arctic show that breeding populations are apparently stable at some sites, especially in the western part of the arctic breeding range in Alaska. We need to understand the migratory pathways of the species in order to know where the decline is occurring, and what can be done to reverse it. 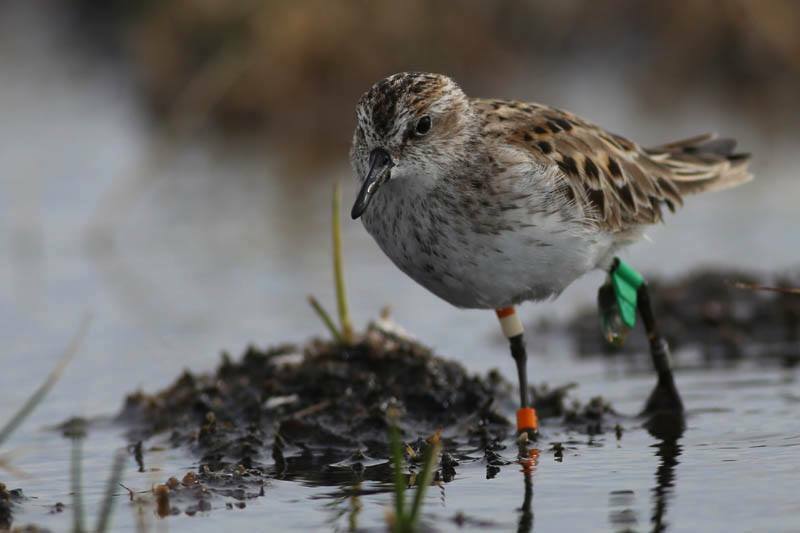 Light-level geolocators are a cutting edge technology and their use has helped revolutionize our understanding of shorebird migration, but they have never been used on Semipalmated Sandpipers before this project. Semipalmated Sandpiper number 254, just before it was recaptured. After sharing its journey with us by carrying the geolocator, it is now getting ready to head out on its next journey back to its wintering area in Brazil. Manomet has partnered with biologists from many organizations, including the U.S. Fish and Wildlife Service, New Jersey Audubon, Kansas State University, the Wildlife Conservation Society, the Canadian Wildlife Service, Simon Fraser University, the Government of Nunavut, and Université de Moncton to coordinate the first effort to use geolocators to understand the migratory pathways of this species. Analysis of the data from the geolocators is key to understanding what the tiny units have recorded during the past year. The map below shows the first ever track of an entire year in the life of a Semipalmated Sandpiper from the eastern Arctic, the group for which the decline may be particularly severe. This particular bird, a male, flew a total distance of over 10,000 miles in the past year. He also made a remarkable six day, 3,300-mile nonstop flight across the Atlantic Ocean from James Bay to South America, before moving on to his wintering area in Brazil. Brad Winn and Shiloh Schulte exuberant about recapturing this tiny Semipalmated Sandpiper after its year-long odyssey. The second geolocator that was recovered at Coats Island had lost battery power, a common occurrence, so it had to be sent back to the company that manufactured it in England to download the data. It should still have recorded much of the journey of the bird it was attached to, and we are excited to learn how its journey may have been similar or different from this one. At the same time, at least 35 other units have been recovered in Alaska. These units are on their way back to Anchorage and will be sent on to Ron for analysis. We will learn an enormous amount from those as well, in particular whether the western arctic birds also winter in the same areas in South America where the aerial surveys have shown the dramatic decline. We will share results here as soon as they become available. We are very grateful to our partners from Environment Canada, who supported our travel back to Coats Island and who have worked with us closely on the fieldwork for this project. We are also very grateful to the supporters who helped make this project happen. Without their commitment to shorebird science, none of this would be possible. We hope you all enjoy this glimpse into a previously unknown world, the timing and flight path of an entire year in the life of a Semipalmated Sandpiper. 23 June, 2013. The geolocator is placed on the bird by Brad Winn, a member of a Manomet shorebird science research team, at Coats Island, Nunavut, Canada. 21 July, 2013. Arrives in James Bay, where it fattens up for its upcoming long flight to South America. 22 August, 2013. Leaves James Bay for a six day nonstop flight to South America. 28 August, 2013. Arrives at the Orinoco Delta, on the border of Venezuela and Guyana. 10 September, 2013. Leaves for a relatively leisurely 11 day flight along the coast to Brazil. 21 September, 2013. Arrives in Brazil for the winter (northern winter, but summer in Brazil). 3 May, 2014. Leaves Brazil for a series of flights north, including stops in Cuba (May 6), Florida (May 10), Georgia (May 11), North Carolina (May 14), and Delaware Bay (May 21). 2 June, 2014. Arrives back in James Bay for the last stopover on its return journey. 10 June, 2014. Leaves James Bay for the final leg of its return journey. 11 June, 2014. Arrives back at its Coats Island breeding site. 18 June, 2014. The bird was re-captured by Brad Winn and Shiloh Schulte, its geolocator was removed, and it was released to begin its next odyssey! Was Semipalmated Sandpiper number 254 banded and outfitted with the geolocator in 2013 as an adult? That’s an awesome round trip. I hope you keep in mind that the data you gathered is from a bird carrying a gps device and not from a free flying bird. As a former test engineer I had to bring that up. The track data is incredibly useful but the times, not so much. Thanks for listening. Brad, would love to do a Bird News column on Semipalmated Sandpiper journeys when you get home. When will that be and is that okay? Absolutely fabulous! Can’t wait to see what you learn from the other birds who were tagged. I hope it’s evident how beautiful this new knowledge is. It’s interspecies collaboration of a best kind. Look at the gentle delicacy in Shiloh’s hold of the Semi-P. This creature has carried a sensor as none of us could carry, revealing the astonishing flights of distance it makes as a matter of course – communicating the miraculous patterns of its life. It can’t tell us this – we don’t see it – without our own fine inventions and miniaturizations that extend our ability to know what the Semi-P can tell us. And we hope – don’t we? – to thread this knowledge into what we do, so we can love, and will not harm, the Semi-P’s lovely life. Fascinating to see a first like this. What an extraordinary journey for such a small bird. Is it common for various species to make a long trek across the Atlantic like that? Or do most hug the coast more? I wonder whether Tropical Storm Fernand, which was particularly rough on Veracruz was a factor in the choice to fly for six days straight, and perhaps a factor in the decline of the Semipalmated Sandpiper. I hope the other data offers more clues. Thanks!! But wait…no, Veracruz aparently wasn’t on this bird’s flight path. What a mystery. Interesting thought though, June. Do long-distance migrants take advantage of strong winds associated with storms (not necessarily close to the “eye”) to assist them? Amazing work! Thanks so much for the info. WOW! I got an email from TK in Georgia on this, and it still blows me away. GREAT WORK that Brad and the whole team at Manomet are doing… to educate the world about the ecology of these special birds, in the hope that genuine efforts will be made at various levels of leadership to protect them and to conserve habitats critical to their survival. Ornithologists of old could only dream of such incredible technology… that a micro-recorder might one day guide us along one tiny bird’s arduous migratory journey: an ambassador of his beleaguered species. Day by day, country by country, state by state… and, perhaps most importantly, from specific river delta, to a bay, a beach, a patch of unspoiled tundra. Indeed, such pioneering work by Manomet and similar groups is providing conservation interests with invaluable, tangible evidence to present to policymakers: we need to close THIS tidal flat during migration; we need to designate THIS river delta as a wildlife refuge; introduced predators must be eliminated from THIS island — the implications are infinite. The biodiversity and, thus, the overall health of Our Planet is at stake! HUZZAH! June and Rick — Yes, long distance migrants — particularly those who make huge over-water flights — can both benefit from and be negatively affected by prevailing wind patterns, including storms. It is well-established that some bird species time their long over-water flights to coincide with beneficial tailwinds and/or the prevailing direction of winds across large areas of their intended flight path (the miniscule Blackpoll Warbler being an infamous case-in-point). Brad knows much better than I do (duh! 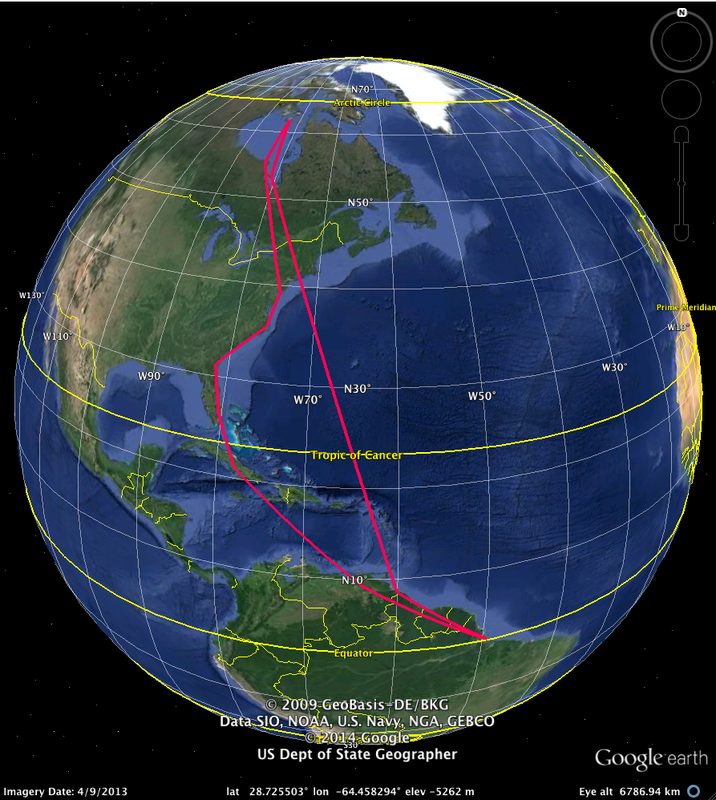 ), but I know there is at least one well-documented case of a Whimbrel that encountered a major storm system during its equally-astonishing southbound flight to stop-over sites in the Caribbean, en route to Brazil. This bird was outfitted here in Georgia with a larger unit, a satellite transmitter, which allowed constant monitoring of its progress. I’ll try to find a link, but I remember that it encountered headwinds related to the storm; it adjusted its path to avoid the worst of it; and finally the expected (or possibly increased?) tailwinds helped this little trooper along after the encounter. Actually, it’s even more amazing! Here’s one article about it… the event I’m referencing was Tropical Storm Colin (2010); the same bird (named Chinquapin) then flew THROUGH Category 3 Hurricane Irene the very next year! Three others shared what must have been exhausting run-ins with the storm and also lived. Unfortunately, the end of the story is not a happy one for two of these hearty survivors of Mother Nature’s wrath (Goshen and Machi), but I’ll let you research on your own. On a positive note, due to the media and public awareness generated by the Whimbrels’ odyssey, their tragic and disgusting final chapter (likely exposed ONLY thanks to the transmitters) caused international outrage. We all HOPE, as mentioned before, that this technology will prove to have effected at least some degree of policy change: what an honor that would be to these dedicated biologists and to the fallen birds themselves. Only time will tell. To end on a GREAT NOTE: Happy World Shorebird Day and weekend!!! Get out and count those shorebirds and report your data to eBird.org!